March is here! The first flowers of the season are starting to force their way up from the soil, we’re no longer having to scrape ice off our cars in the morning and the supermarket shelves are filling up with Easter eggs. It also means it’s the perfect time for a spring clean in Gielinor. Feather dusters at the ready! In much the same way as the Mining & Smithing Rework was a rethink of how those skills worked in RuneScape, this month our attentions turn to Firemaking. Until now there’s not really been a huge incentive to train the skill – and that’s something we want to change. In fact, March is a whole month about fixing things. Bounty Hunter is being retired and its rewards redistributed throughout the game. Plus, we’ve revisited the fiddly transmog system, and changed the over-competed abyssal demons and dark beasts systems with a new slayer dungeon. On top of that we have the arrival of our SGS Competition winner items and, as you may have already seen, a nice little Elite Dungeon surprise. We’ve been aware for a long time that Firemaking wasn’t quite where it needed to be in RuneScape, with no real reason to train it. Luckily our Incense Burner and Firemaking Week is designed to kickstart a new era of combustible fun. Central to the Firemaking rethink are the new Incense Burners - 18 new potion-like incense sticks that are made with Firemaking. They combine the use of various logs, herbs and impious, accursed or infernal ashes. Wergali Gives a 0.5% chance to automatically string bows and automatically attach feathers to arrow shafts when fletching logs per level of potency. Provides XP and doesn't require secondary items. Avantoe Gives a 5% chance of automatically adding bait per level of potency when placing a hunter trap. Doesn't require the bait in inventory. The changes to Firemaking will arrive in game on March 18th. We can safely say that we had the very best intentions with Bounty Hunter, but sadly over time it stopped being fun or viable. As a result, Bounty Hunter will close this month. However, the good news is that all the content that used to be locked away behind it will be redistributed throughout the game on March 11th! The biggest change comes in the form of a new slayer master, Mandrith. With Bounty Hunter now gone, he was looking for a new job, and we felt he’d earned this promotion! Mandrith will now hand out Wilderness tasks and slayer challenges. Rewards, including bounty emblems, can then be claimed from his new shop in Edgeville Bank. Players will need to be level 85 slayer to engage with Mandrith. If you’re PK’d while holding a bounty emblem it will tier down and the killer, should they also be holding one, will siphon half the points that the tier was worth. These emblems can be cashed out (outside of the Wilderness) for reward points, just as before. Because this master only has a few Wilderness denizens as tasks, you won’t be able to use your block and prefer lists with him. Mandrith’s special challenge has you thinning the numbers of a variety of NPCs, with additional rewards for killing optional bosses. Amulet of the Forsaken will be found in the original Barrows minigame. Those wanting a rune pouch will be able to craft them from magical threads gained from Runecrafting via the Abyss. Small pouches require 30 threads and large pouches 100 threads. Ogre flasks will also be craftable, requiring 10 robust glass. They they will now hold 6 doses. Ancient warrior equipment patches will be found on revenant ghosts’ drop tables and may also be dropped while on a wilderness slayer task. The revenant pets will be unlocked from a new drop from revenant ghosts. This item unlocks the next tier of pet and gets progressively rare each time you use one. Many of these pet tiers were unreleased before now. NPCs in the wilderness will have a shared droptable for rare loot. The tougher the NPC, the better chance you have on rolling on it. The weapons Annihilation, Decimation and Obliteration will still be available from Mandrith’s reward shop, among other items & unlocks. Attention slayers! March 25th sees the introduction of a new slayer resource dungeon that’s filled with abyssal demons and dark beasts, which - as you all know - are two of the most competitive slayer mobs. This will give players additional options. The dungeon will be available to those with level 100 Dungeoneering. Another big feature is the introduction of three new Raid practice modes for The Liberation of Mazcab. These will allow players to repeatedly fight Beastmaster Durzag or either of Yakamaru’s main phases. Note that as it’s a practice mode: no killcounts or loot will be awarded for successful runs. The fight has been made a lot smoother, with various QoL fixes across all the phases. The drop system has changed to allow everyone, as opposed to just 1 person, to roll on a rare item each fight. Minions will now shout when they die, allowing players to more easily identify what order they died in. Phase 3's icicle mechanic has been reworked to be less of an annoyance. Legendary pets will, when scavenging, now go for the single most expensive item in that pile of loot rather than a random one. The fight with Dungeoneering boss Stomp will now end immediately once the third set of crystals has been placed, removing the need to wait for a phase transition. The Richochet ability will now hit secondary targets from a range of 6 tiles, up from 4. The 6th-Age Circuit now has a teleport to Tormented Demons. Remora's Necklace now has unlimited teleport charges, making trips to the Queen Black Dragon slightly less of a chore. There’s a brand new Treasure Hunter promo on the way this month that offers both a new type of lamp and some brand new cosmetics. What’s so special about these lamps? 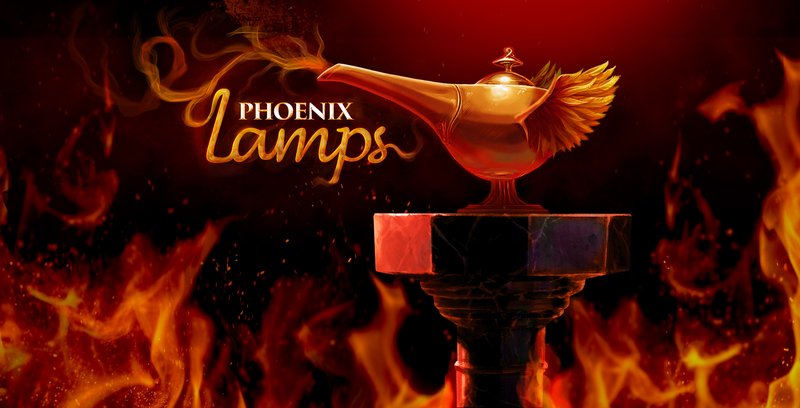 As the name might suggest, Phoenix Lamps have a chance of being saved upon use, meaning they live to be used once again! Like smouldering lamps, if a skill is chosen that has bonus experience, up to the same amount of bonus experience is converted into normal experience as well. A new winged backpack, a fetching glowing aura and a winged chest pet will be up for grabs. At long last the winning SGS carnival competition submissions are coming to life! 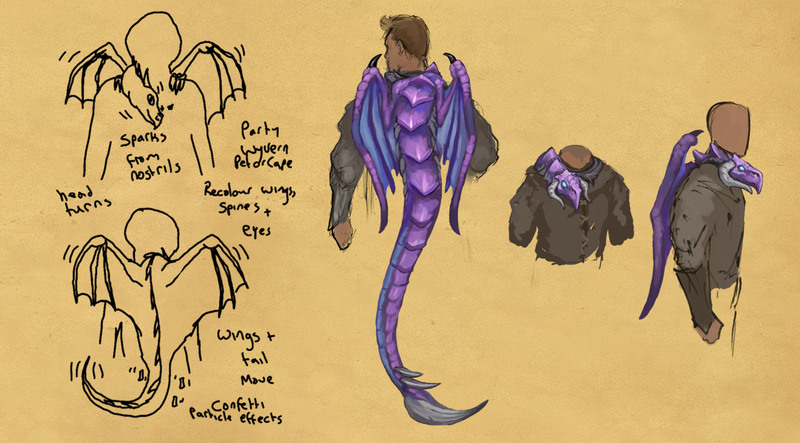 From March 4th players will be able to pick up the winning Wyvern Cape and the runners up duo of the Fairy Drake and Night Fairy Drake from Solomon’s General Store. Many congrats to Claire (Best Pud Pud) and Nadia (Dalia) – both will of course get their winning creations for free! As we’ve said before, some elements of the original designs were so ambitious they proved a bit of a stretch for our tech, but we hope to revisit them in the future when the situation has changed. As many of you will have already seen, alongside the final Elite Dungeon, Shadow Reef, we also released a surprise new quest that ties the storyline of all three Elite Dungeons together. We hope you enjoyed discovering it! For those who haven’t yet tried it, the story is set after the events of Sliske’s Endgame. It starts with players investigating a cult and ends in a confrontation with the mighty Ambassador! Throughout the quest you’ll encounter old friends and new allies, and engage in puzzles and exploration, learning more about the Ambassador’s storyline and connections to the other characters on the way. To get started simply speak to Bryll outside Daemonheim. Players require 12 Agility and 34 Woodcutting to play the quest, and of course you will need to be able to complete the Elite Dungeons to progress. If you’ve already completed the Elite Dungeons (even if only in story mode), you are given the option to skip those parts of the quest. Rewards include 10% damage reduction on all three of the Elite Dungeons (stacking with story mode damage reduction) as well as lamps, a pet and some cosmetic overrides.